Powers and Abilities Superior strength and sight, sharp fangs and claws, and a simple, animalistic personality. Appearance Human except when under the influence of a full moon, when they have yellow eyes, fangs, and claws. In mythology, werewolves are entities that are human but shape shift into wolf form during certain lunar timeframes. This phenomenon is also referred to as lycanthropy, for the Greek lykoi (wolf) and anthropos (man). The change from man to wolf is held to be possible by witchcraft or magic, and can be voluntary or forced by certain cycles of the moon and certain sounds (such as howling). In some folklore, werewolves are immune from aging and most physical diseases. They can be killed by any wound that destroys the heart or the brain or by any form of death that causes brain or heart damage (such as hanging or other oxygen-deprivation methods). Sam and Dean encountered werewolves when they were quite young.. In 1995, Dean tells Sonny the bruises he has are from a werewolf. In 1997, Sam writes an essay for English class about a werewolf hunt his family was on the previous summer. The Winchesters would not come across another werewolf until 2007. Emerging from Greek Mythology, the werewolf is a person who changes into a wolf by means of magic or by being placed under a curse. Most of the time, this transformation is brought on by the appearance of a full moon. It is believed that the only way to kill a werewolf is with a silver bullet. Werewolves are humans that transform into wolf-like creatures under the influence of a full moon. They can either be born as werewolves to werewolf parents, or become a werewolf as a result of being bitten (known as a "bitten"). Pureblood werewolves also prefer to use the term lycanthrope. When they are in wolf-form, they appear human except for their yellow eyes, fangs, and claws, and they use their superior abilities and enhanced senses to hunt humans and eat their hearts. They may not remember transforming or any of the details of what they've done as a werewolf once they return to human form, but it seems that whatever subconscious desires or fears they feel as human translate into action when they are werewolves. Werewolves may live solitary lives or live in a pack, and can survive eating animal organs, however it is extremely difficult, especially if they have fed on human hearts before. At least one pack was shown to be involved in the Maw of Fenris, a cult which believed in the superiority of werewolves and extinction of humans. Their beliefs are based on the Norse legends that Fenris (the wolf son of Loki) would kill Odin during the end times known as Ragnarök. This pack believed in this for generations until Reverend Jim Myers took over and turned the pack from violence. However, the reverend's wife and three other members of the pack still believed in this and strove to achieve it before being killed by Dean. After the Apocalypse is averted, it seems that werewolves no longer transform only during the full moon, as Samuel mentions that werewolves have been appearing during half-moons. Crowley reveals that there is an Alpha Werewolf, but as of the year 2010 he has not been located. The only confirmed way to kill a werewolf is by piercing its heart with silver. An entry in John Winchester's journal posited that a werewolf could be cured of lycanthropy by killing the werewolf who infected him or her, but this is disproved by Sam and Dean, and the fallacy of the theory is in fact well known by other hunters, such as Bobby. When they are killed in werewolf form, they revert back to their human form. Like vampirism, lycanthropy can be cured, provided the sired is found early enough. After the British Men of Letters quelled the final werewolf outbreak in England in the 1920s, they soon discovered a plasma therapy in the '30s, which required the live blood of the sire werewolf. Testing it on mice, they discovered that one in nine test subjects were cured of lycanthropy. The treatment was only tried on a human subject once, where it failed and caused the subject to die an agonizing death. The treatment was then abandoned in favor of outright killing any werewolves. In 2017, the therapy was used on Claire Novak, which temporarily induced her heart to stop, before reverting her back to a human and resuscitating her. Making her the first human successfully cured of lycanthropy. Enhanced senses - A werewolf's sight, smell and hearing are enhanced beyond that of a humans. Infectious bite - A single bite by a werewolf will cause a person to turn into a werewolf themselves at the next full moon. However, a scratch from a werewolf's extended claws does not appear to transfer the infection. Regeneration - A werewolf is typically able to heal themselves from most wounds. If a morally wounded human is bitten, once they turn, all their injuries will be healed. Super strength - Werewolves have superior strength and agility. Decapitation - Werewolves can be killed through decapitation. Dismemberment - Kate was able to kill Brian Wilcox by ripping him apart. Silver - Contact with silver can cause a werewolf great pain, piercing a werewolf through the heart with silver will kill it. Silver nitrate - An injection of silver nitarte into a werewolf's blood stream is as lethal as a silver bullet. Silver sulfate gas - Inhalation of sulfate gas can suffocate a werewolf. Vamptonite - The Leviathan food additive, "Additive 3.0", would kill werewolves along with vampires and ghouls and anything else with a taste for humans. Werewolf cure - A plasma therapy devised by the British Men of Letters, where a recently turned person can have the effects of lycanthropy reversed. However, there is a 99% fatality rate when administrating the cure. A person who shapeshifts into a wolf or wolflike creature, either by using magic, or after being placed under a curse. The idea of transforming during the appearance of the full moon was an idea that was picked up by fiction writers. In popular culture, a werewolf can be killed if shot by a silver bullet, although this was not a feature of the folk legends. The name most likely derives from Old English wer and wulf. The first part, wer, translates as "man". The second half, wulf, is the ancestor of "wolf". An alternative derivation of the word has the first part coming from Old English weri (to wear), making the full form in this case: wearer of wolf skin. Historical legends describe a wide variety of methods for becoming a werewolf, such as the removal of clothing and putting on a belt made of wolfskin, rubbing the body with a magic salve, drinking water out of the footprint of the animal in question, and drinking from certain enchanted streams. According to Russian lore, a child born on December 24th becomes a werewolf. Folklore and literature also depict that a werewolf can be spawned from two werewolf parents. Becoming a werewolf by being bitten by another werewolf is common in modern fiction, but rare in legend, in which werewolf attacks seldom left the victim alive long enough to transform. A "bitten" is a werewolf who was human and as the name states, bitten, by a werewolf. Their transformations are dictated by the lunar cycle and typically have no memory of the things they have done as werewolves. As werewolves, the bitten are controlled by their id, and will typically go after people that may have wronged them in some way in their human lives, killing and eating their hearts. However, John's Journal records that werewolves within four generations of a pure-blood werewolf are "less feral and can transform before, during and after the lunar cycle." These types of "bitten" can control their instincts to a point, but it becomes increasingly more difficult for them to control themselves if they have fed on a human heart. "Pure-bloods" are those who are born as werewolves. Pure-bloods have more control over their transformations, and have the ability to transform at will. In their werewolf state, they can control their hunger and feed on animal hearts, but like "bitten" if they consume a human heart, it becomes more difficult to control the urge to go after humans. Dean tells Ronald Resnick that the old werewolf stories sprang from shapeshifters. Sam and Dean haven't encountered a werewolf since they were young, and, when they come across a series of deaths they suspect are caused by a werewolf, Dean is excited for the hunt. In a cruel twist, the woman they begin by protecting, Madison, is a werewolf herself. In werewolf form, Madison has canine-like teeth and claws, as well as enhanced strength and agility. She does not remember anything of her wolf-time activities after she reverts to human form. After tying her up, Sam learns that she was recently bitten by a "mugger" in the same area where their werewolf's victims have been killed. Sam is convinced that the mugger was actually a werewolf and, because information in John's Journal suggests that killing the werewolf who 'sired' her may cure Madison, they postpone killing her until they find her sire. Dean goes hunting and finds Madison's neighbor Glen, who in his werewolf form has been killing prostitutes (possibly due to his religious beliefs). Dean shoots Glen with a silver bullet, killing him. Madison doesn't turn into a werewolf the next night, despite it being a full moon, so they believe her cured. Sam and she share a passionate interlude, but when she falls asleep the next night she transforms again. Seeing no other solution, Madison begs Sam to kill her, and he reluctantly shoots her with a silver bullet. In this episode, the Winchester brothers begin their supernatural investigation by looking into a vampire attack. However, the next victim seems to have been attacked by a werewolf. They are confused until they learn that they are dealing with a shapeshifter who disguises himself as classic horror movie monsters, including Dracula and the Wolf-Man. In an essay he writes about his summer vacation for his English teacher Mr. Wyatt as a kid, Sam mentions hunting a werewolf the previous summer with John and Dean. So, we know that werewolves are basically id gone wild, right? I mean, whoever they hate, they kill when they wolf out. Crowley and the Winchesters suspect werewolves are the culprit behind a series of deaths where the victim's heart has been ripped out. Sam mentions that werewolves no longer only change on the full moon and relates that "Samuel and I ganked one about six months back on the half-moon." It is revealed that it is not werewolves responsible but skinwalkers, which Bobby tells Sam are cousins to the werewolves. Like the werewolf, a skinwalker can be killed with silver, eats its victims hearts, and can turn other humans with a single bite. However, skinwalkers are not bound by the moon cycle and can change at will, taking the form of everyday domestic dogs. Bobby mentions a "werewolf dance party" on highway I-80. Dean: Hey, check this out. 'Werewolves that are turned up to four generations from pure-blood...' Think he means Alpha? '...are less feral and can transform before, during, and after the lunar cycle.' Boom. Sam: Let me see that. Pure-bloods don't black out during the transformation. They can control themselves. Sam and Dean investigate a mysterious death in a college town that turns out to be the work of a pure-blood werewolf who is a college professor in town. Professor Ludensky, being a pure-blood, had been able to control himself and was eating animal hearts instead of human, but gave into his urges and ate a human. Sam and Dean track him down and kill him to which he thanks them, but find a camera in his office. Tracking the camera back to Brian Wilcox, they find a movie put together by Brian and his friends Michael Wheeler and Kate that depicts how Michael was bitten by the professor in an attempt to get a scapegoat for when Sam and Dean arrived and his transformation into a werewolf. It follows through Michael killing another young man and eating his heart, the three listening in on Sam and Dean discovering the nature of pure-blood werewolves and Brian discovering the professor is the werewolf who turned his friend and confronting him for answers and to get him to bite him. The movie contains the professor’s explanation of his activities and Brian returning home where he kills Michael and tries to get Kate to join him as a werewolf and fall in love with him. Kate kills Brian and finishes his movie, leaving it for Sam and Dean along with a message that she plans to control herself and only feed on animal hearts. Sam and Dean, rationalizing that she hasn't harmed anyone human yet and may not, decide to give her a chance but agree to kill her if she starts feeding on humans. Dean, while talking to Irv on the phone, says that he knows about werewolf Siamese twin case Irv and Bobby worked in Saskatoon. After being dropped off at Sonny's Home for Boys, Sonny asks Dean how he got the bruises on his arms, to which Dean replies that he got them hunting a werewolf. Tracking down Garth after fining out he is in the hospital after being hit by a car, and under arrest for eviscerating a cow, Sam and Dean learn that he was turned into a werewolf six months earlier after being bitten while killing a rampaging werewolf. Garth has joined a pack of mostly pure-blood werewolves who coexist with humans led by the Reverend Jim Myers and has married his daughter Bess Myers. While Garth insists the pack is harmless, Dean is suspicious despite all clues to the contrary. Eventually Sheriff Pat reveals himself to be a werewolf and lures Sam and Dean into a trap in an attempt to kill them. Sam kills him and they discover that a silver bullet he wears as an amulet has the word Ragnarok on it. Looking for clues, Dean discovers that the pack worships Fenris and are part of a cult called the Maw of Fenris that wants to bring on Ragnarok and rule over humanity. Dean confronts Reverend Myers who is innocent while his wife, Joy Myers and two other pack members, Russ and Joba capture Sam, Garth and Bess with the plan to murder Garth and Bess and frame Sam and Dean so that Reverend Myers will lead the pack against humanity and cause Ragnarok. Dean, having worked out who the true bad guy is, kills Russ with a silver knife and uses his jacket to mask his scent so he can get close enough to rescue his brother and friends. Joba attacks him after he gets inside the barn where Joy is about to kill Sam, but Dean kills Joba with his knife and then Joy in an impromptu duel. Reverend Myers is left horrified by what his wife and pack members tried and while Garth offers to return to hunting, Dean tells him to remain with the pack who Sam and Dean leave alone as they are not all bad. Violet Duval and her brother Julian belong to a powerful werewolf family in Chicago. Violet and David Lassiter - who belonged to a rival family of shapeshifters - were at one point in love and planned on running away together. However David's brother Sal Lassiter made her leave him in order to stop the union.. Years later Violet is to be married in an arranged marriage her father set-up with a pack of werewolves from New York. When Sal is murdered, Violet suspects Julian of being involved in the murder. Julian threatens her, saying war is coming between the families. Later as Violet is leaving the Duval mansion, she realizes one of the butlers is David Lassiter, and makes him shift out of the butler's form. He tells her he wants to try and stop the conflict before it starts. Suddenly a hooded figure attacks David, but before he can kill David, the hooded figure is shot by Ennis Ross, who flees, taking Violet with him. At his lair the hooded figure reveals himself to Violet be nothing more than a human, Irv Sokolowski, who blames Sal Lassiter and her brother for the murder of his young son. When David is captured trying to rescue her, the hunter Irv, plans to kill him but is stopped when Violet transforms and attacks him.. Safe at her home, Violet and David share a kiss before they go their separate ways. Sam and Dean learn of apparent werewolf kills in Durham, Washington and investigate. After finding a witness to the attacks, they check out a farm where they find Kate, the werewolf they let go two years before. Kate doesn't deny killing the people and they nearly kill her before Sam gets a call revealing that there was another attack while Kate was with them, meaning Kate is innocent. Kate escapes while they're distracted, but they use her cell phone to track where she's staying. Sam and Dean follow what they believe to be Kate, but it turns out to be another girl. She acts scared until they go to test her for being a werewolf at which point she attacks them. Kate keeps the two sides from killing each other and the other werewolf runs off. When asked why, Kate reveals the girl is her sister Tasha. Kate explains that by eating animal hearts and using meditation and yoga, she has controlled her werewolf side and the only person she has ever killed is Brian Wilcox because he went crazy. Kate even keeps a silver knife on her in case she loses control at which point she insists she will use the knife to kill herself. After leaving school, Kate returned home, but decided that it was too dangerous for her family, so she left to find a new life. After finding out that Tasha was mortally injured in a car accident, Kate visits her in the hospital to say goodbye and ultimately turns her into a werewolf to save her life. Unlike Kate, Tasha embraced being a werewolf and is the killer Sam and Dean are tracking. Kate refuses to help them kill Tasha, insisting that she can control her. Dean claims they have a cure for being a werewolf and can turn Kate and Tasha back if Kate leads them to her sister. Kate agrees. Kate leads Sam and Dean to a cabin that she and Tasha used to visit with their parents, but Dean handcuffs her to the Impala's steering wheel as they really plan to kill Tasha. Entering the cabin, they are ambushed by Brandon and Travis, two young men that Tasha has turned into werewolves to be her new pack. Kate breaks free and confronts her sister who demands she either leave or kill Sam and eat his heart to join her pack. Kate refuses to leave or kill Sam so Tasha sends Brandon and Travis into another room with Sam and Dean while she talks to Kate. Kate tries to convince Tasha over to her way of thinking, but Tasha, who has been pushed around all her life, has embraced her new nature as it makes her strong. Realizing she's lost her sister, Kate hugs Tasha and kills her with her silver knife before fleeing, taking with her Tasha's bracelet. At the same time, Sam and Dean easily kill Brandon and Travis and find Tasha dead and Kate gone. Later that night, Kate calls Sam and Dean from a truck stop. They tell her that if she keeps away from them and doesn't harm humans, they won't go after her. Kate agrees, but can't promise as she knows now how easy it would be to lose control. Corbin and Michelle Tilghman become captives of a pack of werewolves at the Wallowa-Whitman National Forest in Grangeville, Idaho while hitching through the national parks for their honeymoon. During their captivity, Corbin is bitten by a werewolf. Sam and Dean arrive in the National park to investigate the case of the missing Tilghmans and another couple. When seemingly at a dead end, the local bar keeper Rose, tells them where some old cabins are, where the lost people may be. Sam and Dean find Corbin and Michelle have been captured and strung up in a cabin. The boys arrive and fight and kill their werewolf captors. During the fight, Sam is shot by a werewolf, and while Dean attends to him Corbin attends to his wife's wounds. When Dean attempts to leave them with Sam, while he goes for help; Corbin tells him there are more werewolves and the four decide to take their chances in the forest. On the way they stop at a rangers sation, and while Dean is out gathering wood for a stretcher, Corbin strangles and seemingly kills Sam. Just as Dean finds him, a car can be heard approaching. It contains Rose and her subordinate, both werewolves. When morning comes the trio reach the road and flag down Sheriff Ben Anderson, who takes the three to the Urgent Care Center. While giving a statement, Corbin attempts to down play Michelle telling the true version of events, with the werewolves. While comforting his wife, Dr. Kessler wishes to check on him. Corbin attempts to refuse, but Dr. Kessler insists. As she is about to examine him, she notices him try to cover his arm and discovers a nasty bite mark and begins cleaning it, telling her that he feels "good." Later, while checking on his wounds, Corbin notices the bite mark has disappeared and sees the scratch across his chest instantly heal. His eyes suddenly go wolf-like and long claws begin to sprout from his fingers. Meanwhile, Sam has regained consciousness just as Rose's companion enters the cabin. He is able to sniff out that Sam is in the basement. When Rose enters, she hears a loud crash and goes to investigate. Once she reaches the bottom of the stairs, she is quickly killed by Sam. Dean fearing Sam dead, takes an overdose to contact Billie the reaper. Just as she is about to reap him, she tells him Sam is still alive, after Dr. Kessler resuscitates Dean. She hears screams coming from a room. She knocks and asks if Corbin is okay. Corbin opens the door, fully transformed into a werewolf and tells Dr. Kessler "I really am" before attacking and killing her. Hearing Dr. Kessler's scream, Michelle and Sheriff Anderson rush to her, as Michelle checks on Dr. Kessler's prone body, Sheriff Anderson is impaled by Corbin's arm. Corbin then attempts to calm a panicked Michelle down, telling her he didn't want this, but she will see how it feels and they can be together forever. Before he can get close to her, Corbin is jumped by Dean. As Corbin gets the upper hand and begins choking Dean, he is suddenly shot in the heart with a silver bullet by Sam, killing him. In 1980, a young Asa Fox is attacked by a werewolf who leaves a permanent scar on his cheek with his claws. Before the werewolf can kill Asa, Mary Winchester kills him with a shotgun. Mary explains to Asa that she's a retired hunter who had history with the werewolf and had went back to hunting briefly to "tie up a few loose ends." The encounter with Mary and the werewolf leads to Asa becoming a hunter himself. While Sam and Dean are missing, Mary Winchester gets a call from Alicia Banes on Sam's cellphone looking for help with a werewolf pack. Mary agrees to come to Alicia's aid. While on a solo hunt, Claire Novak tracks down a small pack of werewolves in Iowa that have kidnapped a young girl named Amanda Fitzmartin. Posing as a delivery person, Claire gets one of the werewolves, Ed, to come to the door where she is holding a box marked as being for Mr. Werewolf. After Ed realizes she's a hunter, Claire kills Ed with silver buckshot from the shotgun she was hiding in the box. After a fight with another male werewolf, Claire kills him with a silver knife through his side and into his heart. As Claire frees Amanda, the final female werewolf sneaks up behind Claire, but Amanda's frightened reaction alerts Claire. Claire quickly kills the female werewolf with two silver bullets to the heart. After killing the pack and rescuing Amanda, Claire returns Amanda home mostly unharmed the next morning. A werewolf is one of the few monsters shown to be bidding on Sam Winchester in an online auction. The werewolf wins Sam's heart, but Dean kills the guy running the auction before he can kill Sam. The Apocalypse World version of the archangel Michael, in the vessel of Dean Winchester, finds a werewolf looking for victims in a bar and captures her to meet with her pack leader, Philippe. Michael suggests forming an army of enhanced monsters to destroy the human race. Later, four werewolves enhanced by Michael's experiments attack Sam, Mary Winchester and Bobby Singer in an abandoned church as part of Michael's trap. Thanks to their enhancements, the werewolves prove to be immune to silver bullets and blades. However, they are still vulnerable to decapitation and the hunters manage to kill all four werewolves. Melanie brings Garth and another werewolf to Hitomi Plaza in Kansas City Missouri to make the "change" and become one of Michael's enhanced monsters. Garth, having been sent as a mole by Sam, was forced to swallow the archangel grace / blood mixture and make the change. After Jack is abducted by Michael, Sam tracks him to Hitomi Plaza where he decapitates Melanie and retrieves both Jack and Garth. 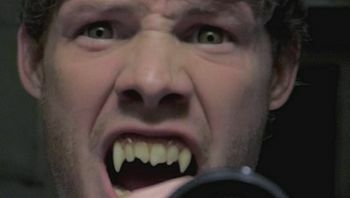 In the parking garage, Garth would become gripped by Michael's will and loose control by turning into a werewolf and attacking both Sam and Jack. As he overpowered Jack, Sam was able to render Garth unconscious with a choke hold. Upon Dean and Castiel's arrival to Hitomi Plaza, they would restrain Garth and place him in the trunk of the Impala. The ability or power of a human to transform into a wolf. There is also a mental illness in which a patient believes he or she is, or has transformed into, an animal and behaves accordingly. Clinical Lycanthropy is a mental illness where the patient believes that they are a werewolf and behave in the same manner. ↑ 6.01 Exile on Main St.